Fundamental analysis seeks to forecast cash flows of a company based on how the economy, industry and the company will perform. Once the cash flows are projected, they are worked backward to a present value. The super computer did its own calculations and concluded that technical analysts were more reliable because “While fundamental analysts were sometimes right, technical analysts were always wrong”. The story is most likely apocryphal but certainly unfair to both the lines of thinking. Let us get down to how fundamental analysis and technical analysis actually differ. Fundamental analysis seeks to forecast cash flows of a company based on how the economy, industry and the company will perform. Once the cash flows are projected, they are worked backward to a present value. This gives an idea of what a stock is actually worth. You buy underpriced stocks and sell overpriced stocks. Technical analysis, on the other hand, focuses on internal market data. The focus is more on identifying patterns and trends that will repeat and which the trader can capitalize on. Remember the basic difference. Fundamental analysis seeks to predict the value of the stock. The price is not a controllable factor, but fundamental analysis does believe that in the long run the price will converge towards value. So if you buy a quality stock that is undervalued at an early stage, then you can make profits. The technical analyst is not overly worried about cash flows and valuations. They believe that the price reflects everything. As long as you can catch the trend and ride it long enough, you will make money in the stock market. The fundamental analyst acknowledges that every stock has a company behind it. Since the company has a certain value due to the cash flows it generates, the stock derives its value from the value of the company. He sells the shares when the market value of shares is more than the intrinsic value and earns profit. The technical analyst believes that there is no real value to any stock. In technicals, stock prices depend on demand and supply forces, which in turn are governed by rational and irrational factors. But the market is all-knowing and hence reflects all that is good or bad about a stock. That is all that matters to a technical analyst. Fundamental analysts do not worry about price trends and volume trends. They believe that if a stock has value, the price will eventually gravitate towards the value. They are also agnostic about the holding period, which technical analysts are not. Fundamental analysts believe that if a stock has value then it even makes sense to go contrary to the market trend and buy or sell the stock. 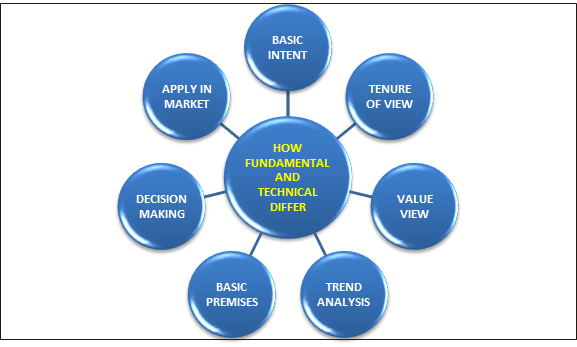 For a technical analyst, trend is the friend and it is trends and patterns that matter in the final analysis. They believe that past trends will be repeated again and the current movements can be used for studying the future trend. Hence, the focus should be to work the patterns and identify the trends. Once the trend is identified and extrapolated, you just need to wait for the trend to repeat. Fundamental analysis is based on the assumptions that stock prices will eventually converge towards value. Therefore, there is merit in studying the fundamental aspects of a stock. They believe that there is big money to be made if such value can be deciphered in advance of the market. Technical analysis works on the core assumption that it is impossible to identify multi-baggers since markets are smart and reflect everything. Hence, the best one can do in this kind of a random market is to identify trends and play them. Trends repeat because the humans who trade the market are still the same and are driven by the same set of emotions. How the decision making differs in both approaches? Fundamental analysis can be a fairly laborious job. It entails the careful study of financial statements, demand forecasts, quality of management, earnings and growth. Finally, the intrinsic value of the company is estimated by a mix of quantitative, qualitative and competitive factors. Technical analysis purely believes that decisions are taken by listening to what the market has to say. Of course technical analysis uses plethora of long standing theories like supports, resistances, oscillators, overbought/oversold zones, stochastic, break outs, Elliot Wave etc. Fundamental analysis helps you to identify undervalued or overvalued shares. The gap is called the margin of safety. Based on this gap, you can take a decision to buy or sell the stock. Even the best of fundamental investors do use technical analysis for timing their entry and exit into stocks.